First Appearance: Born in Cuidad Mexico in 1939. First appeared as a comic character in ? Powers/Abilities: Skilled wrestler. Near superhuman physique. History: Another Mexican "Masked Fighter" who battles monsters and vampires when not in the ring. The infant who would grow up to become one of Mexico's greatest heroes was an orphan found in his dead mother's arms in war-torn Europe during the Second World War. Sent to an orphanage, a group of scientists adopted the child and tested their theories on creating a superman on the boy, putting him through an intense scheme of physical and mental exercises. By the time he reached adulthood he was the perfect human. Then the scientists released him into the world with the mission of battling evil and savng innocents. Comments: The fist Luchador character created specifically for movies, Mil Mascaras was created by film producer Enrique Vergara, who made pictures cashing in on the craze that was sweeping Mexican cinemas. 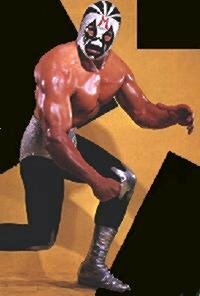 With Santo having walked out on him after a contractual dispute, and Blue Demon recently injured and unable to work, Vergara needed a new leading man. He recruited a young athlete, Aaron Rodriguez, who had been a contender for the Mexican Olympic judo team, and turned him into a star. In spite of this "false" beginning, his movie generated so much interest that he was able to swiftly establish a genuine wrestling career. His film career would last 17 movies and 24 years. His wrestling career is still going, in spite of the fact he is now over sixty years old. That last paragraph has now become slightly inaccurate as David Owens informs me that "Mil Mascaras is currently in Columbia, MO, shooting in a new film: Mil Mascaras vs. the Aztec Mummy" as of 10th December 2004. Seems a Luchador's work is never done. Alejandro Salas Jiménez informed me of the following bit of trivia - a line of dialogue from his first movie can be heard in the album "The Sinister Urge" by Rob Zombie (in the song "Feel so Numb"). Thanks to Richard Lopez for corrections.